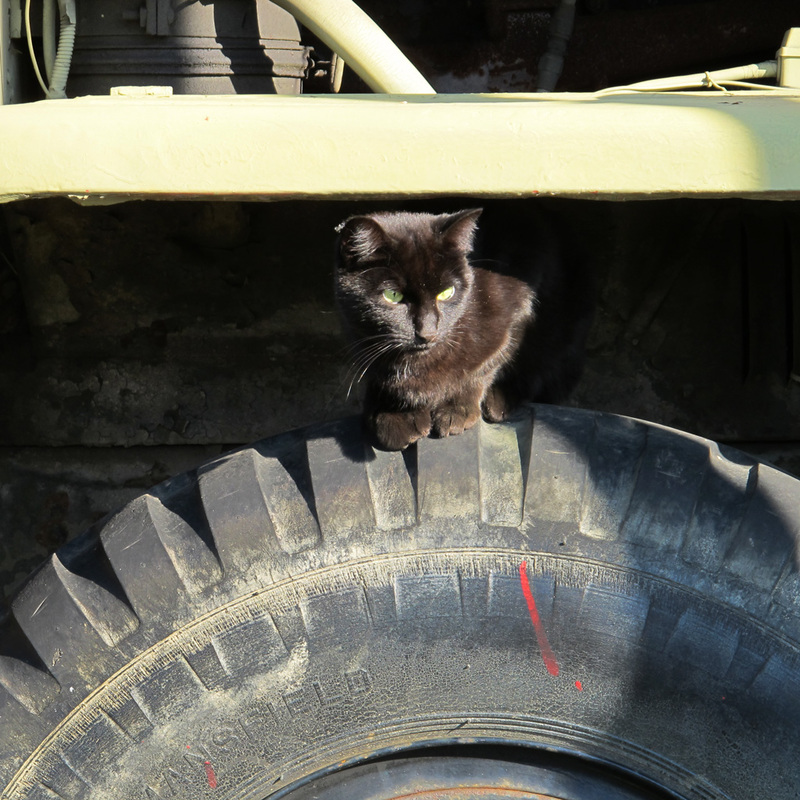 A black cat, resident of a hardware store's property, peers out from the wheelwell of a disused industrial truck. During a little exploration Sunday afternoon, we happened across a couple of “working cats” — felines that live on the premises of businesses, not strays but not housecats. One cat lives in the yard of a small town hardware store. There’s a large industrial truck parked permanently in front of the store’s windows but behind the firewood for which we were shopping. On the giant tire of that yellow-green truck was a beautiful black cat that put us in mind of our dear departed Missy. The kitty posed for a few pictures then, wary of strangers’ attentions, took off for parts more secluded. Stopping by at a nearby winery we sighted another cat sunning and grooming itself on a sub-roof near the main entrance. Kit paused, took a good look at us, then went about its business and we did the same. The wine wasn’t very good. 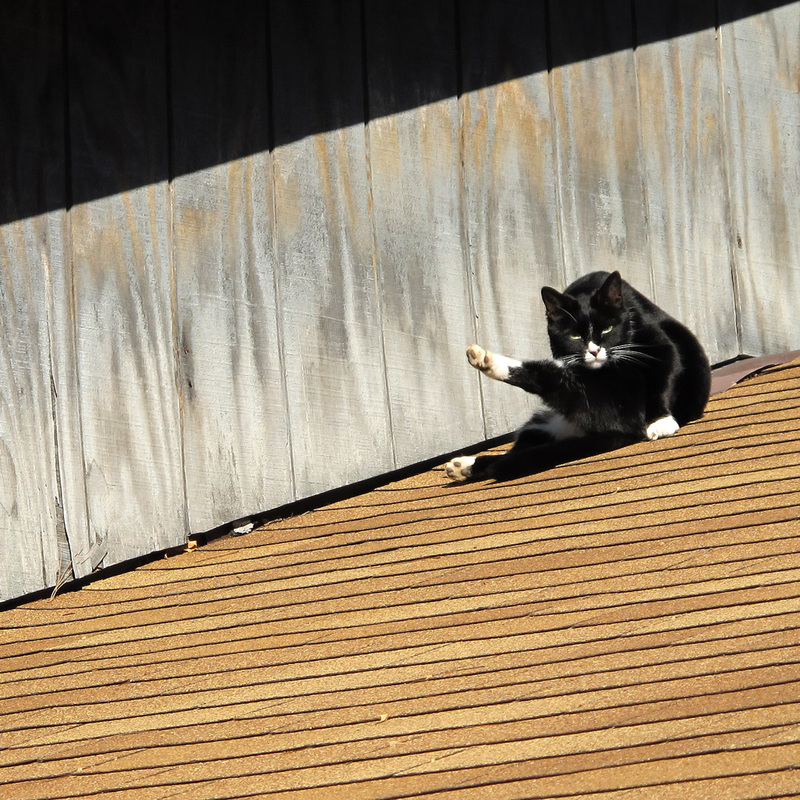 A cat suns and grooms itself on the shingled roof of a winery. Photo by James Guilford. I love the second one. He’s got such personality. I reallly like the pose of the second one too. The contortions cats can make! Cats really can bend around! Some people refer to the pose captured here as “Kitty Yoga.” There’s even a tee shirt depicting the subject. How amazing, the second cat looks so human, as the fiction anthropomorphic cat “Blacksad”from comic album series created by Spanish authors Juan Díaz Canales (writer) and Juanjo Guarnido (artist), and published by French publisher Dargaud. Nice shots! A bit of kitty yoga going on as well! I believe I’ve seen a tee shirt like that! LOL!! I love both pictures. The second cat looks as if you distracted him while he was exercising and he is none too happy about it! I used to own a cat that preferred to live on the roof. She would sit on the highest peak and watch the world way down below. As I entered our street coming home from work I would see Kim sitting up there and could imagine her whiskers twitch as she thought about dinner! By the time I got the door unlocked and through the house she’d be sitting at the back door.